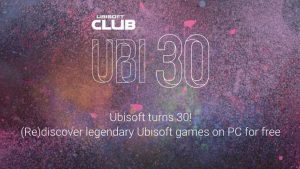 On December 15th, Ubisoft announced on its “Ubisoft Club” site the 30th “Special Weekend”. Prince of Persia: The Sand of Time: The original PoP game that introduced the famous time slowing and reversing mechanic with some well-designed platforming segments and somewhat good combat. Tom Clancy’s Splinter Cell: Again, the original 2002 tactical, action game, with blockbuster levels of production. The game that showed gamers the world of espionage and introduced one of gaming’s greatest spy/ secret agent: Sam Fisher. The Crew: The open world racing game that lets players race each other or just drive around the US. released in 2014, the game has amassed a massive player base and some fairly good reviews. Beyond Good And Evil: A 2003 classic adventure game, that with its’s original premise and story captured the hearts of many, all of who still to this day are yelling at Ubisoft for a sequel. Far Cry 3: Blood Dragon: A stand alone DLC for Far Cry 3, this FPS love letter to 80s cheesiness takes the mechanics of the original game, paints it in neon and sprinkles giant laser-firing lizards known as “blood dragons”. My personal picks from this bundle. Assassins Creed 3: The third installment of the AC franchise, taking place in colonial America, and the game that introduced many staples for future games, like fights against riffle men, forest/ jungle traversal and some ship versus ship combat. 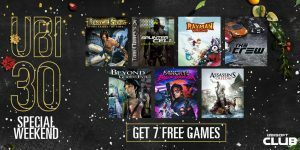 All these great tittles you can get for free if you log in to you Ubisoft account and claim them before December the 18th.